Skin problems are quite common medical problems for a pet dog. A dog can be quite prone to skin problems like infection, inflammation, scabies, and many more. Many owners don’t even realize that their lovely canine is suffering from these skin problems. If you don’t keep your dog’s hygiene then your dog might be more prone to these skin problems. To identify skin problems, diagnose it, and then help to cure it before it gets worse you will need to look up carefully to your lovely canine companion. If you are a beginner at taking care of a dog and don’t know much about skin problems for a dog then you might need all of the information you can get. Many owner aren’t realize these skin problems might attack their dog, so in order for you to become a better dog owner, we will give you some of the most common skin problems that might attack your dog, what are the symptoms and how you can help to cure it before it getting worse. Always keep your dog healthy and happy then soon you will realize that you will have a lifelong companion. Every dog deserves for love, attention, shelters, and to be at perfectly healthy. It is our responsibility as a dog owner to give our dog what they deserve. If your dog had a certain skin problem, you might see that your dogs will constantly scratch their body furiously. Some of the dogs might even chew on the body part they are itching with. This constant scratching or chewing might be caused by some skin problems in your lovely pooch. If your dog scratching too much, it can also cause harm in their skin like infection and inflammation, so you need to watch out. The sound of your poor pooch scratching and chewing might be really annoying too. To help you understand what skin problems your dog might suffer, and how you cure it, you will need to know about many types of skin problems. If you are still learning to take care of your canine family member, then you need to understand about dog’s skin problems. Many owners didn’t realize these skin problems attacking their dog. So, that’s why we are here, and we are here to help you understand more about dog skin problems, what are they, and how to deal with them. Without further ado, let’s get started. Just like a human, a dog can also get allergies if contacted, eaten or being close at something they allergic into. Allergic dermatitis can cause your dog to relentlessly scratch one body parts, sometimes paws or belly. If you look at closely you will see a red ugly rash on your dog if your dog seems to caught allergic dermatitis. Your dog can get allergic to many different things, from pollens, insect bites, certain food products, environmental irritant, and many more. Identifying what your dog allergic into is one of the best precautions to help make sure your dogs can avoid getting allergic dermatitis. If your dog already got severe allergic dermatitis on their skin, then you might as well contact your trusted veterinarian for allergic medication to ease this skin problem. Yeast infection is also a common occurrence among the dog. If the dog seems to have irritating itch around their ear, neck, and paws, they might suffer from yeast infection. In this area, yeast has quite a fertile place to grow, living them fairly easy to give your dog yeast infection. The most common symptoms of yeast infection are the changes in skin color, followed by irritating itch in certain areas. The professional vet should easily diagnose any yeast infection on your dog. If you think your dog might suffer from a yeast infection, contact your vets for medication. Yeast infection can be easily cured by some topical cream, oral medication, and some vets might also recommend medicated bath. Seborrhea is a skin problem that caused your dog’s skin to develop scales like dandruff and then becoming greasy. Seborrhea is mostly a genetic skin disease that occurs when the dog is still puppies, but it can also be a symptom to another skin disease such as allergic reactions and abnormalities in your dog’s hormone. This skin problem isn’t really hazardous for your pooch, however, if the seborrhea is only the underlying symptoms of more complicated skin problems, you might need to contact your vets for further medication. Seborrhea itself can be easily treated using a special medicated shampoo. Ringworm is a skin problem caused by fungus, not worm, so don’t be deceived by its name. The symptoms of this skin disease is a circular patch that can be found on anywhere on dog body, but mostly on dog’s head, ears, paws, and also legs. The circular patches mostly followed by inflammation, hair loss, and sometimes scaly patches. Puppies are more easily susceptible to this disease. If your dog might getting this skin problem, there are the various fungal medication you can take. Some vets would recommend some topical cream too to help ease this skin problem. Pests are definitely the most common skin problems for any dog. Pests like mites, lice, fleas, and many more thrive on dogs fur, in a humid environment, and in a dirty dog. Mites can cause a lot of problem in a dog’s skin. 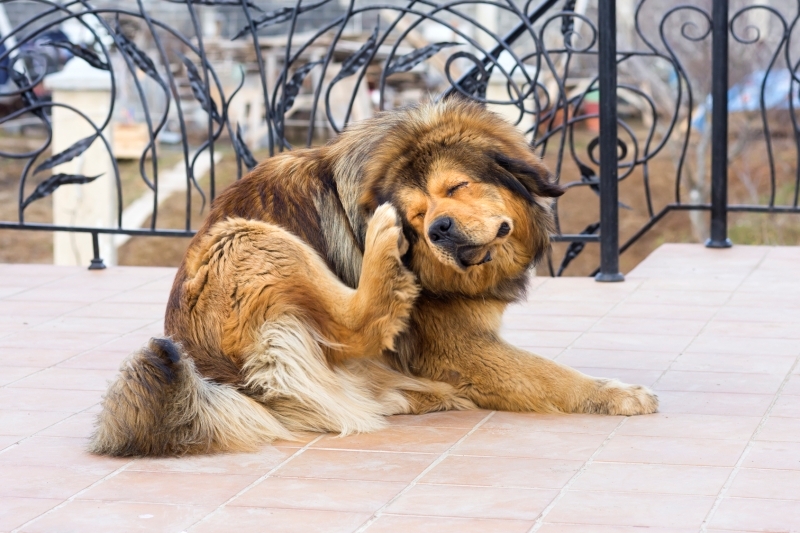 Causing irresistible itch in your dog skin resulting in inflammation and infection, causing many bacterial infections and the lists goes on and on. To help your dogs avoid getting pests infestation on their beautiful fur, you need to keep your dog’s hygiene. Make sure your dog is always clean, and keep your dog’s environment from a dog’s cage, bedding and their toy is clean. A tumor is a dangerous skin disease not only for human but also for a canine. Your dog can get dangerous tumor growing on their skin without you even realizing it. If you see a hard lump on dog’s skin that looks like acne, but bigger, then you need to seek out vets help right away to confirm if it is a tumor or not. Your vets can arrange for the tumor removal, and if the tumor isn’t yet spread that will be enough to cure it. Let’s just hope you can realize skin rumors on your dog as soon as possible. That’s it, the skin problems that your dog might suffer to without you realize. There are many owner aren’t realize these skin problems might attack their dog, with this article we hope more people will be well informed on the dog’s skin problem.